Butter. Chocolate. Sugar. Pasta. Wine. Those are the five food groups, right? A bright red, sturdy box within the corrugated brown outer box, contained myriad ice packs, thawed but still cold, some promotional materials, party decorations, and butter. There were one 7-ounce bar (salted) and two new spreadable butters in 7-ounce tubs, one simply salted, and the other .... wait for it ... sea salt! I didn't quite swoon, but I was pretty giddy! In the end, each type would get its own vehicle - its own parade float, as it were. 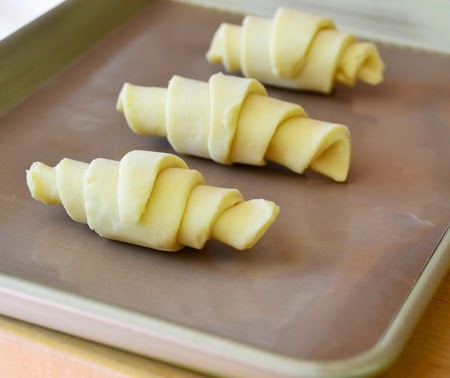 The salted bar was carefully worked into flour to become a slab of quick puff pastry - rolled, cut, and baked into crescent rolls. Sublime! 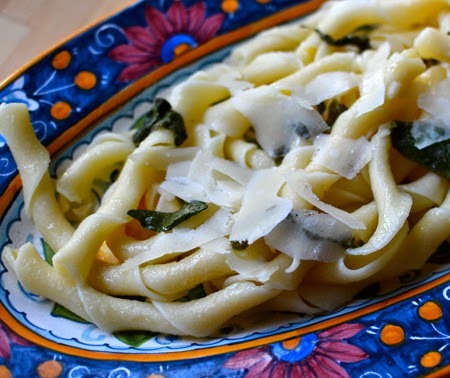 The salted spreadable butter adorned pasta, flavored simply with some sage from our garden and a light grating of Parmigiano-Reggiano. Exquisite! As you may recall from my post, Confessions of a Salt Addict, I am a salt-oholic. I really love salt. But, oddly, I never buy salted butter, as I prefer the creamy flavor of the butter, adding my own salt according to whim or taste. The pastry was so tender and flaky. 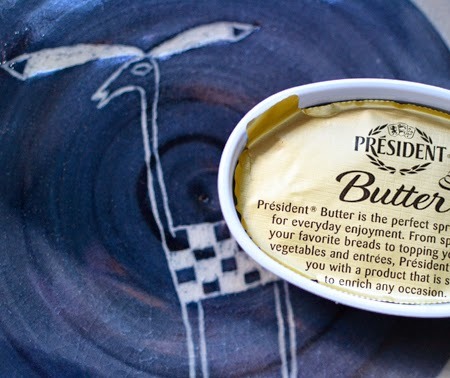 It is perfect for a savory use; I would not use this butter for a dessert pastry. 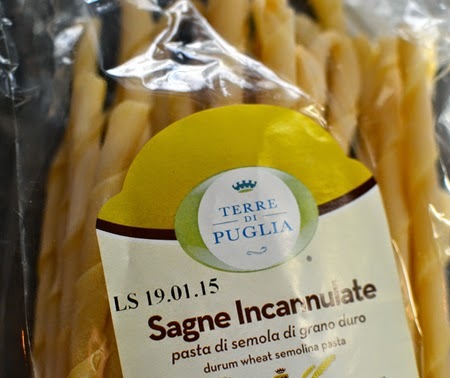 The salted spreadable was amazing on the pasta - its soft, velvety feel on the tongue is just what pasta burro e salvia requires. The sea salt spreadable butter on bread was perfection. The saltiness toned down, and it made the bread taste incredibly good. Normally, I butter my bread or toast with unsalted butter and sprinkle on my own salt, but this was not difficult to swallow! One of my favorite qualities of Beurre Président is how it melts in the pan for sautéeing and searing. It doesn't spatter and spittle because it hasn’t been padded out with water like U.S. butters. It browns chicken and meats beautifully, and imparts the flavor of pure cream. And for Sole Meunière? There is no equal. I started this buttery journey loving Beurre Président unsalted butter, and I have opened my arms and heart to its salted kin. There is a time and place for each, and they are not interchangeable. Think carefully when using salted and unsalted butters, and how the salt will affect your final dish. Speaking of Sole Meunière, here is my mother's recipe. A real favorite. 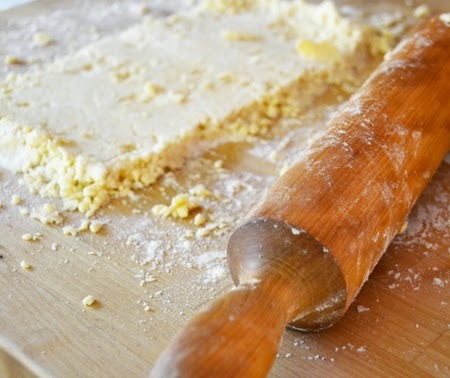 Place flour in a pie plate. Sprinkle both sides of the fish with salt (lightly) and freshly ground pepper. Dredge fish on both sides with flour, and shale off excess. place floured fillets on a platter and set aside. Heat oil in a large, well-seasoned skillet until it is hot, and shimmers. Add 2 tablespoons of the butter; quickly swirl skillet to coat. When foam subsides, add fish and cook until golden - about 2 minutes per side. Divide fish between 2 heated plates, tent with foil, and set aside. In a small skillet, heat remaining butter and cook until golden - about 2 minutes. 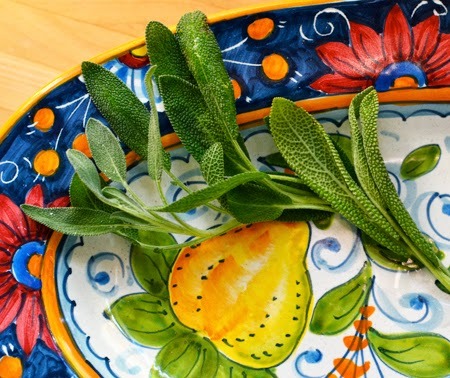 Remove from heat, and add parsley and lemon. The sauce may sputter. 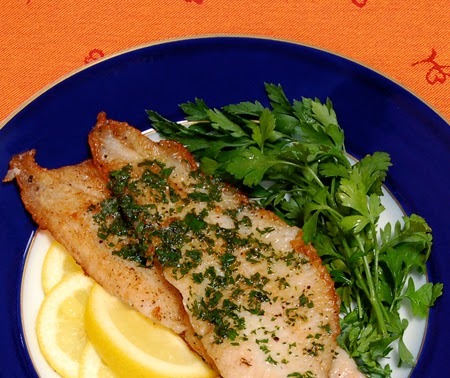 Spoon sauce over fish, and serve with lemon wedges and sprigs of parsley. Wow!! How giddy would I be if I came home to find butter at my doorstep (or should I say with my doorman!). What a wonderful gift and you did it proud! 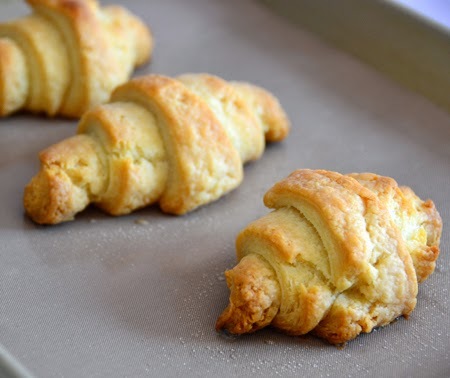 Those little croissant puffs are adorable. 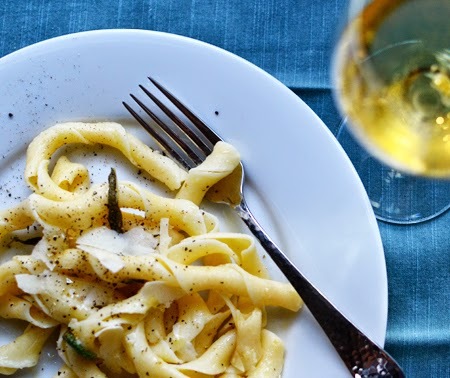 I also adore butter, in fact I usually cook with butter in stead of olive oil recently, reserving my olive oil for baking and eating fresh!!! Great post David, have a fantastic weekend. Thanks, Ahu! I think I switch back and forth between butter and olive oil depending on the finished dish, but I do use a lot of butter! By the way, I only have two more weeks to go before I have homemade vanilla extract! Ditto what Ahu wrote about finding a box of butter on my porch! I wish I had been a house guest the week you experimenting. Each dish looks enticing! And, finally, so relieved you are indeed including something from the five food groups! Hi David, wow! a box of butter, I would be giddy. Very interesting about the differences and uses for each one. Great Post! Thanks, Cheri. It was a fun post to write (and eat)! I'm trying to figure out which one I'd be dipping into first. The sea salt, perhaps? Not that I'd be turning my nose up at the others, either! Although shown in opposite order, John, I did try the sea salt version first with bread I'd made that morning! Butter party sounds so much better than a Mazola party, doesn't it? You will love the sea salt, Greg - and, yes, you said it, and you are right. I have recently discovered European style cultured butter from Organic Valley. Talk about a love affair!? They have 2 kinds out there (at least around here in the Albany, NY area) I can eat this right off a spoon it's so good. Can you get this where you are? 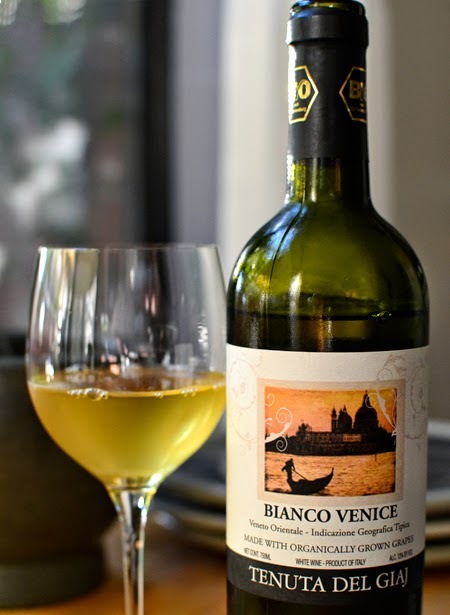 I highly recommend that you try it! Thanks for the tip, Cathy - I will keep my eyes open and look for Organic Valley today. 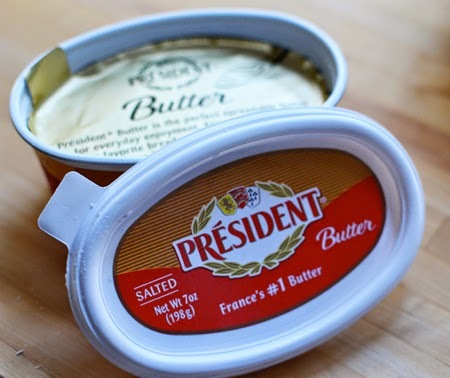 Have you tried any of the Beurres Président? Yum! David, you certainly made wonderful things with the French butter that you received - all of them are different and all of them look amazing, the quick puff pastry rolls, the pasta as well as your mum´s sole meunière, all three are treats that I would love to taste! Bread and butter is also a big weekness for me. I am embarrassed to say how much I used!! Hae a great weekend, Cory! Oh, we call European butter "good butter" in our house! 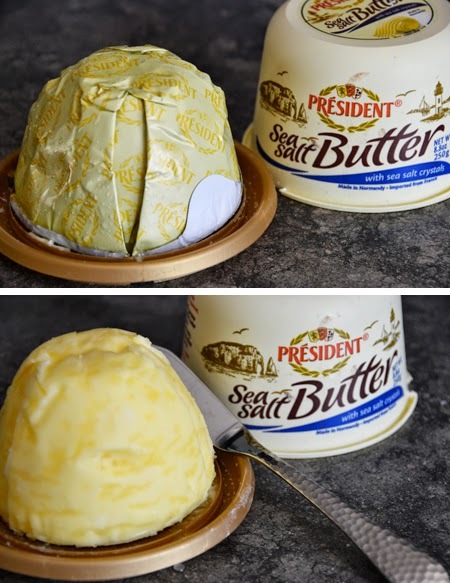 I still recall the first time we had Vermont Creamery's European style salted butter - heaven and we couldn't get enough of it. What a special treat to arrive home to this package. We used 'good butter' for the holidays when my mother or actual butter instead of margarine. It now takes on a similar meaning for us and the European butters! Aren't you lucky! Butter is definitely a food group in my home, having been raised by a French mother! I've never purchased salted butter either, but your descriptions are great. Very tempting! Mimi - I think YOU were lucky to have a French mother and that you always had good butter in your house! Oh if someone sent me a box of butters, I'd be as giddy as a schoolgirl too! Now, as far as the food groups go, I'd only change out the wine with coffee:). Otherwise, you're spot on. There isn't anything that butter can't make perfect! I love unsalted butter because I'm not a salt addict like you, but I must have salt and can tell immediately when it's missing. But like you said, unsalted and salted butter have their uses. I'll take either butter! All I can think of is the scene in Julie and Julia, where Meryl (as Julia) has her first Sole Meunière, and utters..."Butter". 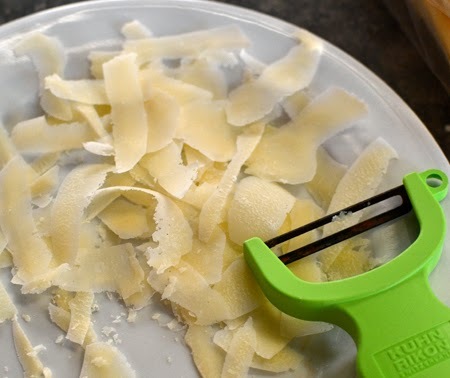 Butter tester as a job? You LUCKY BOY!!! I almost included that scene in the post, Karin! She was probably used to some oleo before that.... just like me! "Mama, I don't need any more bread with my butter." Also....did you know what Andreas Viestadt of Scandinavian Cooking show said? He said "Butter is Norwegian oil." I love that. 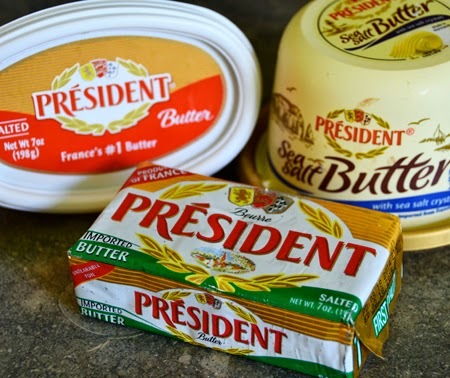 I have been buying "Kerry Gold" from Costco but I am going to look for President butter, too. Liz, I wish I had photographed the package but, for me, it was as if I was 3 years old on Christmas morning. I wanted to get to the present - who cared about the wrapping?? Thanks, Laura! It is nice to have you back a - and I hope you collected a lot of good recipes while you were traveling! Now YOU are the lucky one! All that gorgeous butter delivered to your doorstep? I'm green! I agree that salt brings out the flavor, but (having major control issues - just ask Mark) I want to add the salt when I want and control the quantity. That said, I still never say no to butter, salted or unsalted! Btw, I didn't see a problem with those 5 food groups! Knowing my readers, I had a feeling there would be some solidarity on this front, Christina! Wow, David! Fabulous post! 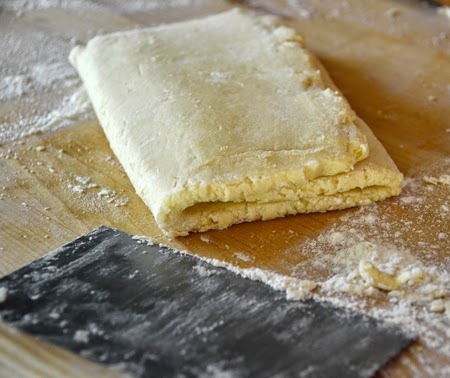 Will you be sharing your puff pastry recipe? 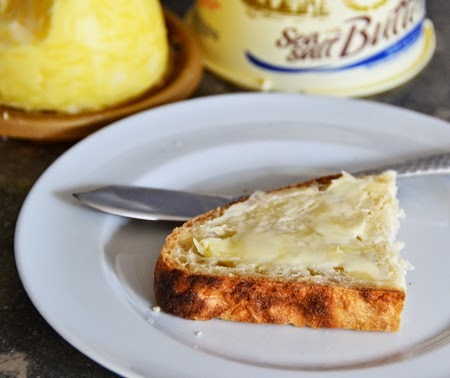 This is the best butter I've ever tasted - and I love all the uses you put it to. 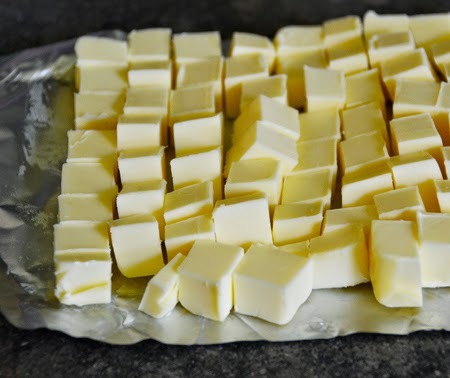 Haha I love your 5 food groups and I agree with your thoughts on butter - everything tastes better with butter :) I will keep checking my doorstep maybe one day a beautiful box of butter will appear. Have a great week! I hope the butter arrives, Karen! Tell me about Australiam butter - what is it like? I would definitely be giddy if that butter arrived on my doorstep! Now I need to start looking for the butter with sea salt…omgosh! Sounds divine! Your puff pastry looks perfect!! 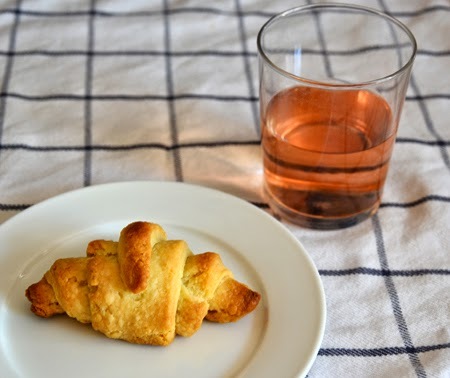 Have you shared your quick puff pastry recipe…I would love to try it! Have a great week, David! Fun post! Thanks, Kathy! I am planning to share the puff pastry recipe in late Decemer when I make a Galette des Rois. In fact, I just purchased some ceramic fèves from France to put inside the galette! I would love to see what your other "food groups" would be in addition to chile peppers, Dedy! I can't imagine meunière with snapper, but if you say it's good, I trust you! It sounds like you made very good use of your butter gift. You must have had a smile on your face for a week…all of your uses sound perfect. Yes, Karen, I think I was smiling a lot all week! Glad you are able to post you (very nice) comments! Thanks, Rakesh and Swikruti! I love how everyone has their own special five food groups! Hope you are having a good week. I know, Sofia - isn't it wonderful? 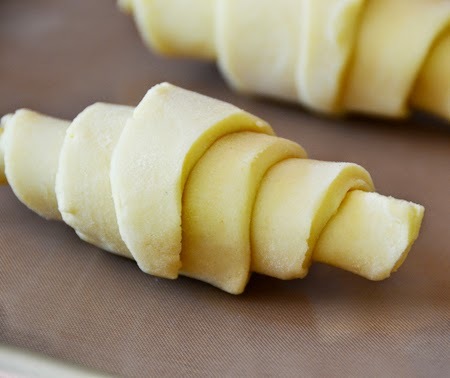 Your little crescents are just gorgeous! I can see all the beautiful flaky layers and crannies thanks to the fresh butter. What a package to receive. It is plain and simple, Yasmeen - butter is good!